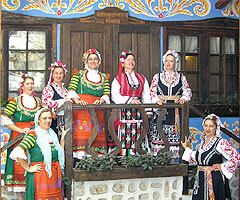 On 16 December ‘Zornitsa’ vocal folklore group will celebrate its 10th anniversary. The group’s foundation in 1997 was inspired by Emil Genov, the artistic director of students’ folklore ensemble ‘Zornitsa’. Since than the group has started its own way. Today, 10 years later, ‘Zornitsa’ has already had numerous concerts, participations at festivals and has sung with popular artists such as Lylyana Galevska and Kostadin Gugov. The group won the special award for authentic song at ‘Macedonia folk 2006’ international festival for the song ‘Dazh kape, Kate. This year they got the special award at the first international folklore festival in Kystebdil ‘Pautalia’. Also, they had taken part in many events along with ‘St. George The Conqueror’ cultural club (with secretary – Daniela Nikolova). They have never missed to perform at the annual workshop for Balkan folklore Balkanfolk. In 2005 the group launched their first CD ‘Pii momtche, vino’. Amongst the directors of the choir we should mention Valentin Yankov, Alexander Stoyanov and Dinko Dimov, who is working with the group now. At the concert, the audience will have the chance to listen to authentic songs and polyphonic author’s arrangements of songs of different musical folklore regions. The vocal group will perform some of the most beautiful Shope and Pirin two-voiced songs as well as the best examples of the genre of arrangements for folklore choirs of Filip Koutev, St. Kanev, N. Kaufman, K. Stefanov and, namely the songs ‘Malka moma dvori mete’, ‘Doshteryo moya maichina’, ‘Zaboril beh da se glavim’, ‘ZLata sedi na chardatsi’.